The goal of this program is to pair schools with conservation sites over the long term, to develop student understanding of ecology and thoughtful participation in watershed stewardship. 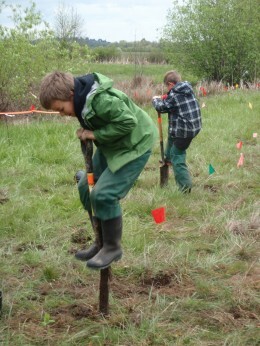 Kids from local schools participate in classroom sessions and field sessions at Greenbelt Land Trust’s Evergreen site and the Jackson-Frazier Wetlands.Each group of students tends their own section of habitat, year over year. On average, 350 students participate in this program each year. Participating schools include Cheldelin Middle School, Muddy Creek Charter School, Corvallis Waldorf, Kings Valley Charter School and Philomath Middle School. Funders include Oregon Community Foundation Gray Family Fund, Oregon Watershed Enhancement Board, and the Jubitz Family Foundation.